When it comes to home remodeling, there is a wide variety of projects homeowners can choose from. Remodeling projects can not only give a home a much-needed upgrade in space and style but can actually increase the value of a home as well. While there are multiple home renovation projects homeowners can take on, this article is going to look at a few common home remodeling projects often seen in Northern Virginia. Home improvement projects come in all shapes and sizes and every area usually has their own set of unique remodeling needs. 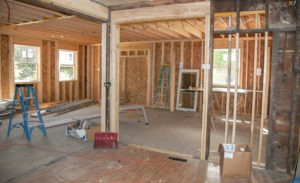 Northern Virginia is no different — when it comes to home remodeling projects, Virginia residents typically focus on one, or all, of the following types of projects. Kitchen renovations: With kitchen upgrades, the entire house seems to get a bit of a makeover. And with the importance of a functional yet aesthetically pleasing kitchen, this type of project is commonly seen in Northern VA. In fact, about 76% of homeowners choose to change the style of their kitchen when they’re working on a renovation project. Remodeling a kitchen can easily transform the area into a multi-purpose space perfect for cooking, working, and entertaining. Additions: Due to expanding families and necessary updates required for older homes, Northern VA homeowners often opt for adding space on to their home rather than moving completely. However, some additions are for wants rather than needs. Common uses of additional areas may include an entertainment or game room, a sunroom, or space to be able to work on a new hobby. Bathroom upgrades: Much like needing additions to their homes, homeowners often find themselves cramped in a too-small bathroom. Whether it’s too add more storage space, incorporate a new tub or shower, or fit a new vanity, bathroom upgrades are commonly seen in Northern VA homes. Simple garage floor coatings , landscape design and home remodeling projects can be a great way to change the look and feel of your home. However, it’s important to choose an experienced contractor who will take the time to understand your wants and needs for your home improvement project. For the experts in home remodeling Northern VA homeowners trust, choose On the Level Contracting. From kitchen makeovers to electrical repairs, no remodeling task is too big or too small for our experienced contractors. Call us today to find out what the best general contractors Northern VA has to offer can do for you.